The British pound is currently enjoying its longest rally since July of last year. Nine straight days of gains has taken the currency from 1.54 to a high above 1.60. When a move in a currency pair becomes this overextended, it screams for a correction. 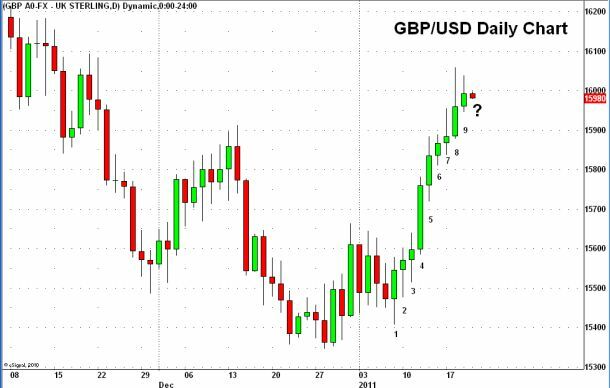 Whether this correction is large or small really depends on the catalyst but when it comes to the GBP/USD, the correction is rarely less than 100 pips. Over the next 48 hours, there are TWO potential catalysts for a turn in the pound -- Chinese data and UK retail sales. Weaker than expected Chinese economic data could easily trigger a wave of risk aversion that sends investors flocking into the U.S. data. Even if the data is good, retail sales on Friday could be bad -- winter storms took a meaningful drag on consumer spending according to the BRC retail sales report. Should the GBP/USD fall, support will be at 1.5850. As long as this level holds, the uptrend will remain intact. Higher inflationary pressures provide fundamental support for the rally in the pound so the currency pair will not give up its gains easily. Anyone have their tin hats on?